Bob first learnt to dive whilst on holiday completing a CMAS* course on August 1989. On his return he joined Bramston SAC in Witham and converted his qualification to BS-AC. After many years diving both in the UK and overseas, he gained many contacts and friends around the world. He qualified as a BS-AC Club Instructor in 1998 and progressed to OWI Instructor in 2001. He is also now a Nitrox and O2 Instructor and has helped other instructors to gain this qualification. For many years, Bob has held the position of Diving Officer at his local club in Witham and is still strongly involved with the training there, his customers and club members can always find him available for information and advice on equipment and diving. After completing a Drager Rebreather course, Bob qualified in 2003 as a TDI Instructor for the Drager Dolphin. 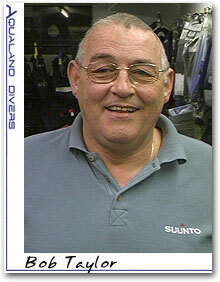 Bob has worked at Aqualand Divers for a number of years when he took ownership in the beginning of 2001. He is also a Qualified Cylinder Tester and a Regulator Service Engineer.